Traditional dental crowns and fixed bridges have offered patients predictable, effective smile repair and tooth replacement options for decades, and we still regularly use these restorative treatments at Renu Dental. However, traditional crowns and bridges can take two or more visits and one or more months for us to complete, which is not ideal. Dr. Jaclyn Jensen and her skilled Crookston, MN dentistry team are happy to offer CEREC same day restorative dentistry services to expedite this process for our patients. Contact us to find out more or schedule an appointment. We welcome Crookston residents as well as patients from Thief River Falls and other nearby communities. CEREC stands for chairside economical restoration of esthetic ceramics and is a computer assisted design and manufacture (CAD/CAM) system that allows our team to quickly design, craft, and place a custom dental restoration including crowns and bridges in just one office visit saving patients time and offering superior customizability for our patients as we are able to make adjustments in our office immediately as needed. CEREC dental restorations are designed, crafted, and placed in the same way that we place traditional crowns, bridges, inlays, and onlays except the entire treatment process is completed in just one visit. We start by carefully removing any damaged structure and otherwise preparing the tooth. 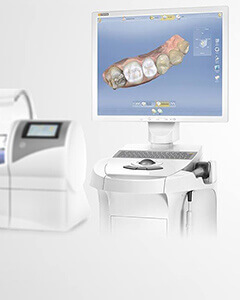 We then use the CEREC digital impression system to capture an accurate representation of the bite with the prepared tooth. This digital impression is sent to our milling unit where we design a restoration to fit seamlessly into the smile line. Next, the milling unit crafts the restoration from a single block of dental grade porcelain. Finally, we carefully place and seal the final restoration.